Wigan earned a vital win against fellow Championship strugglers Leeds United but remain in the relegation zone. A Liam Cooper own goal and a fine James McClean effort sealed the Latics' win. McLean's cross was knocked past his own keeper by Cooper before Billy Sharp forced a save from Scott Carson, who later denied Giuseppe Bellusci. Leeds' Sam Byram somehow scooped over the bar from a yard before McLean sealed victory with 10 minutes to go with a fierce effort from close range. The hosts started the better of the two sides but Wigan took the lead with their first attack. McClean went down the left-hand side and an unsuspecting Cooper turned the Republic of Ireland international's cross into his own net. Leeds' Mirco Antenucci was seeing plenty of the ball down the left, and Sharp's header from one of his deliveries was flicked over by Carson. Marc-Antoine Fortune almost doubled the lead just before the break but was denied by the legs of Marco Silvestri. Antenucci fired wide before Bellusci had a shot tipped over by an increasingly busy Carson. Wigan were looking dangerous on the counter attack and a McClean shot was parried by Silvestri and helped away by Bellusci. Ivan Ramis did likewise at the other end as Steve Morison tried to play in Sharp, with the substitute then seeing a header tipped over well by Carson. Leeds knew it was not their day when Byram somehow scooped over the bar from a yard and then McClean, who had just tested Silvestri with a low strike, made it 2-0. Wigan boss Malky Mackay: "Any time you come to Elland Road, with the atmosphere here and the size of the club, and come away with a win is really pleasing. "We've been playing okay, we've lost to single-goal margins with individual errors. Today one of the big differences was we made the correct decisions on most occasions." Leeds manager Neil Redfearn: "The first goal is a mistake, and how many times have we said that after being in a good position? "That gives Wigan a bit of impetus and something to defend, and they defended well. I think had we got it back to 1-1 we would have gone on to win the game." Match ends, Leeds United 0, Wigan Athletic 2. Second Half ends, Leeds United 0, Wigan Athletic 2. Corner, Leeds United. Conceded by Iván Ramis. Attempt blocked. Giuseppe Bellusci (Leeds United) right footed shot from outside the box is blocked. Foul by Stephen Warnock (Leeds United). James Tavernier (Wigan Athletic) wins a free kick on the right wing. James McClean (Wigan Athletic) is shown the yellow card. James McClean (Wigan Athletic) wins a free kick in the defensive half. Goal! Leeds United 0, Wigan Athletic 2. 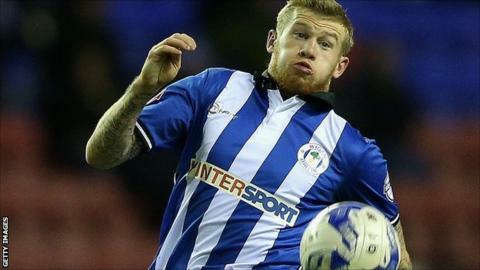 James McClean (Wigan Athletic) left footed shot from the left side of the box to the top left corner. Assisted by Don Cowie. Attempt missed. Roger Espinoza (Wigan Athletic) left footed shot from outside the box is close, but misses to the right. Assisted by James McClean with a through ball. Attempt missed. Rodolph Austin (Leeds United) right footed shot from outside the box misses to the left. Attempt missed. Rodolph Austin (Leeds United) right footed shot from outside the box misses to the left. Assisted by Lewis Cook. Attempt missed. Steve Morison (Leeds United) right footed shot from the centre of the box misses to the left. Assisted by Sam Byram with a cross. Attempt missed. Sam Byram (Leeds United) right footed shot from the left side of the six yard box is too high. Assisted by Stephen Warnock with a cross following a corner. Attempt saved. Steve Morison (Leeds United) right footed shot from the centre of the box is saved in the top left corner. Assisted by Rodolph Austin with a headed pass. Attempt saved. James McClean (Wigan Athletic) right footed shot from the right side of the box is saved in the centre of the goal. Assisted by Roger Espinoza. Chris McCann (Wigan Athletic) wins a free kick on the left wing. Attempt blocked. Michael Tonge (Leeds United) right footed shot from the centre of the box is blocked. Assisted by Steve Morison with a headed pass. Don Cowie (Wigan Athletic) wins a free kick in the defensive half. Substitution, Leeds United. Souleymane Doukara replaces Billy Sharp. Substitution, Wigan Athletic. Roger Espinoza replaces Marc-Antoine Fortuné. Offside, Wigan Athletic. Chris McCann tries a through ball, but Andrew Taylor is caught offside. Attempt saved. James McClean (Wigan Athletic) left footed shot from the left side of the box is saved in the top left corner. Assisted by Andrew Taylor. Attempt saved. Rodolph Austin (Leeds United) right footed shot from outside the box is saved in the bottom left corner. Assisted by Steve Morison with a headed pass. Attempt missed. Billy Sharp (Leeds United) header from the left side of the box is high and wide to the left. Assisted by Stephen Warnock with a cross. Attempt saved. Lewis Cook (Leeds United) right footed shot from outside the box is saved in the centre of the goal. Assisted by Billy Sharp. Corner, Leeds United. Conceded by Chris McCann. Corner, Leeds United. Conceded by Don Cowie. Attempt blocked. Lewis Cook (Leeds United) right footed shot from outside the box is blocked. Assisted by Rodolph Austin.